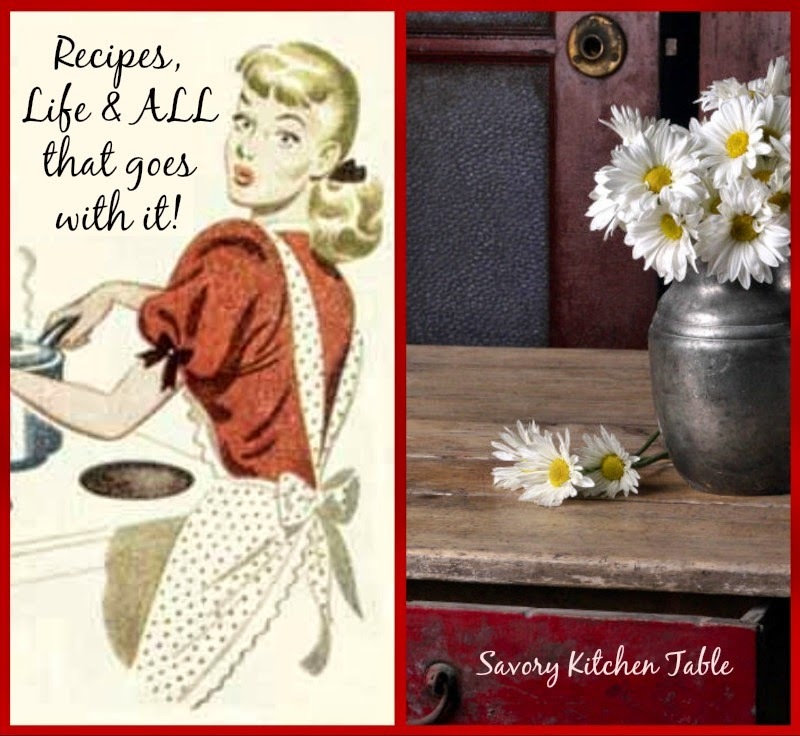 Savory Kitchen Table: IT'S getting close to THAT TIME OF YEAR AGAIN! In the Fall I'm usually stocking up for winter in the wild and snowy north. 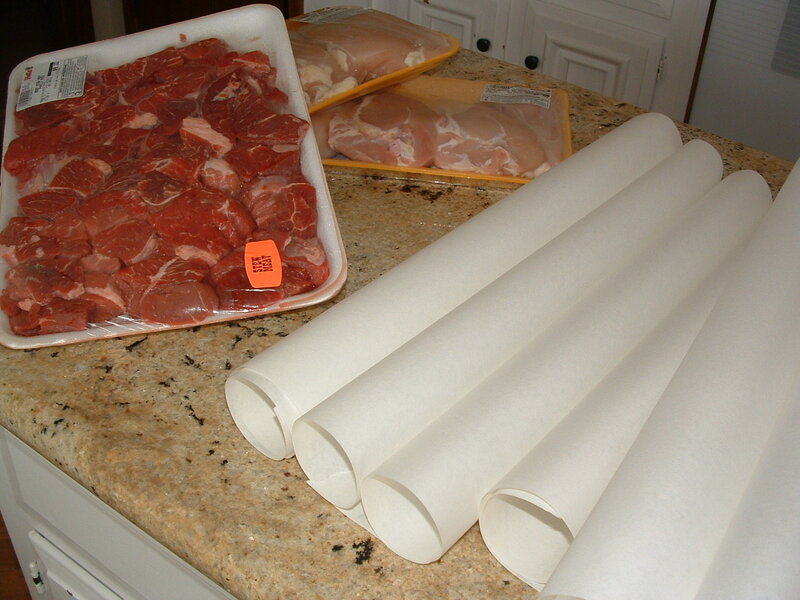 I start with LARGE bulk packs of meat. 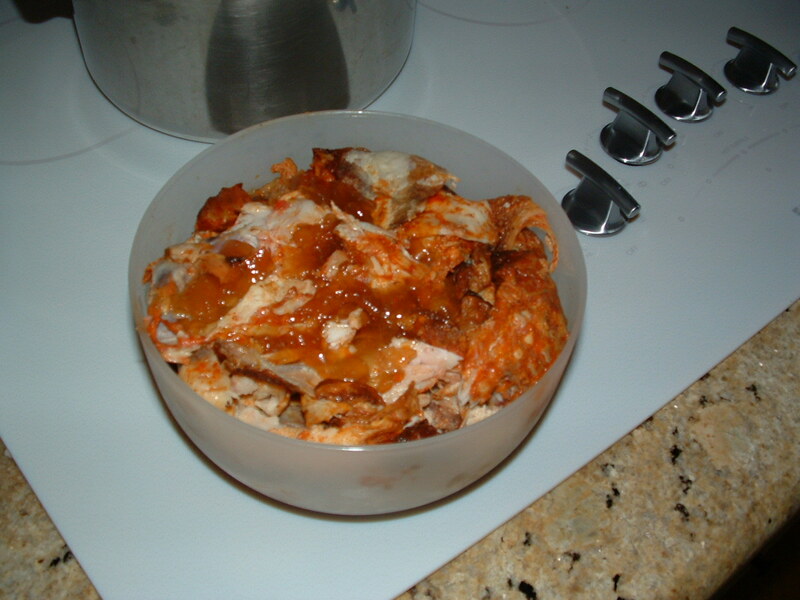 I then break them down by size and meat right down to cutting certain recipes into bite sized pieces. Then I wrap them in freezer paper because I really hate freezer burn! 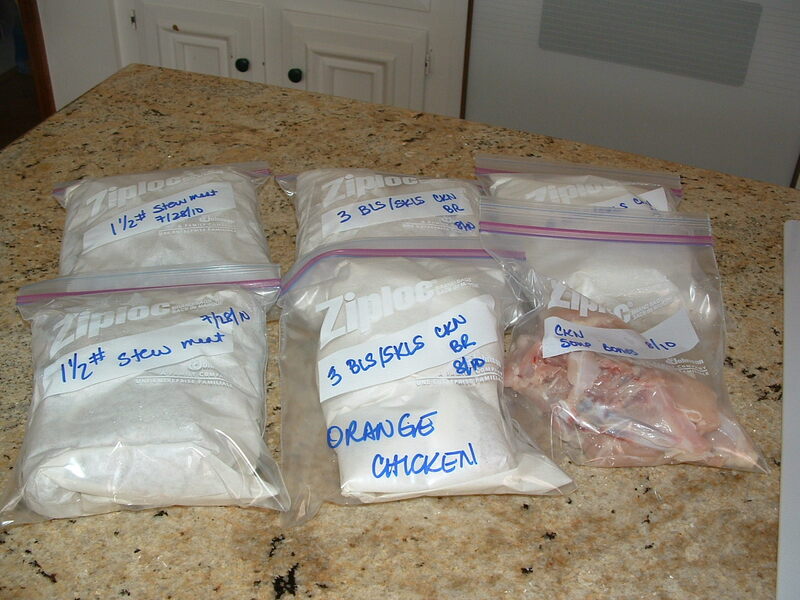 And I package them into pre-labeled ziploc bags for the freezer. I didn't get a secondary picture, but I then wrap the center of each one with a strip of duct tape. Yep, you read that right, duct tape. Just a small strip. Enough so when they're stacked in the back of the freezer you can identify the meat. I buy it in colors - red for beef, green for chicken and blue for pork. It makes it soooooooo much easier when you're searching in the freezer for the right meat. Many times this prep includes rotisserie chickens. My market at home has buy one, get one free on Tuesdays. Can you figure out when I did my shopping? By the time I get home and put away the groceries, the rotisserie chickens are cool enough to pick off the bone. 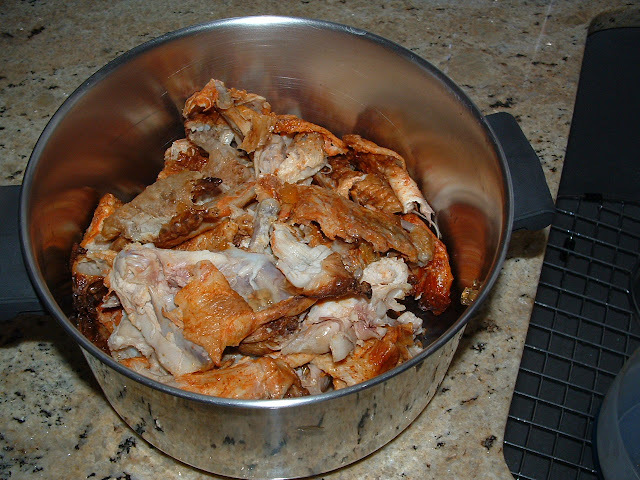 The bowl below is the skin, congealed juices and bones I collected as I stripped 2 birds. I think Martha (MM) and I met over some post about buying in bulk and we found a common ground - saving money! Talk to your butcher. Many times you can save even more than the advertised sale prices. For example, recently my local market was running a sale on chuck roast. None of the roasts were as large as I really needed for company so I asked the butcher if they had one the size I wanted and instead she offered up a manager's daily sale (in the bulk section just a few feet away from the ones I was looking at) where I could buy twice as much for half as much saving me $8 over what I intended to spend and gave me enough for 3 meals. I made ALL the chuck roast as Pot Roast & Veggies for company and then used the leftovers to make Ortega Chile Bake and Black Eyed Pea Chili. I then use a large stock pot and cover the "debris" with water. I set it to simmer on a low temp and let it go for an hour or so. I don't add any seasonings since I've normally bought mesquite broiled or lemon herb, but adjust according to your tastes. 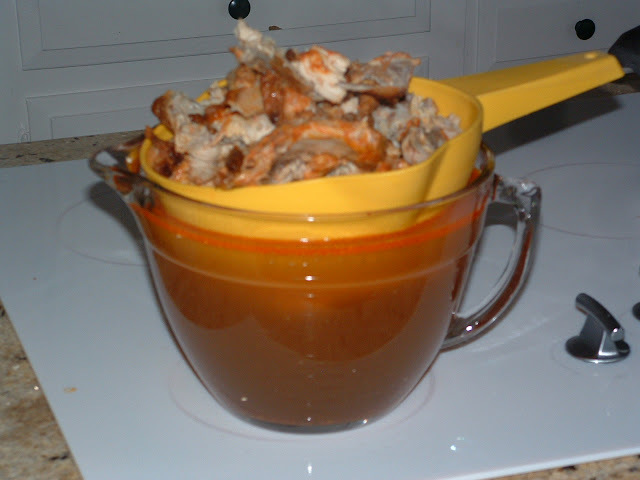 Then I drain it into my large 8 cup measuring cup and allow it to cool. 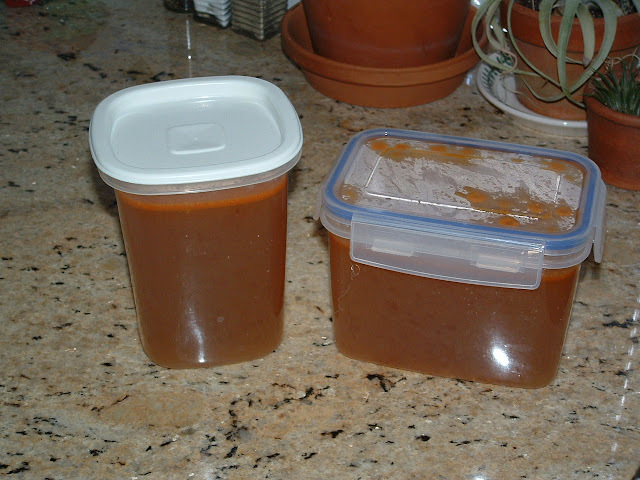 I have several of these containers that I bought just for chicken stock in the freezer. 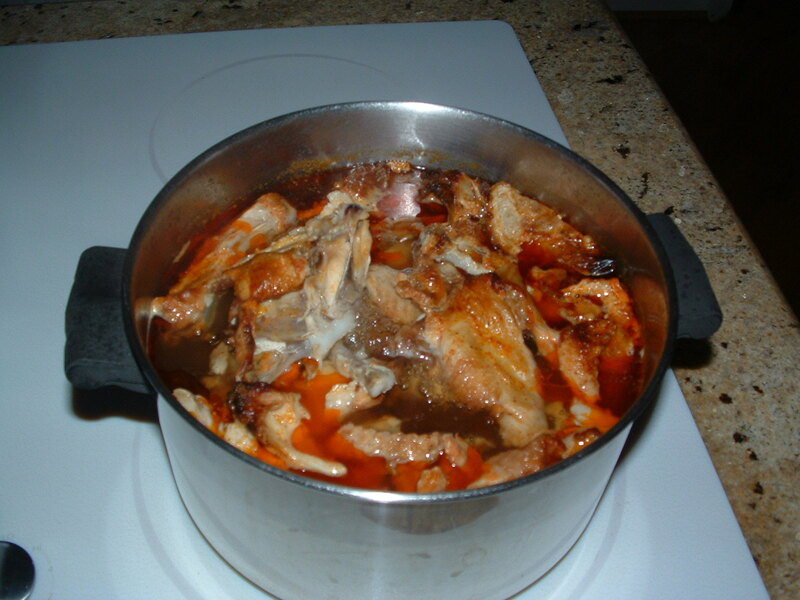 I haven't bought chicken stock in over 10 years now. It's just so easy to make your own. Even if I start with raw chicken and poach it for a recipe I add seasonings and by the time the chicken is done, there is several cups of broth ready for the freezer. Today's flavor was Mesquite broiled so it left us with a spicy red color also. So what do you do to get ready for winter? Have I motivated you to stock up? Have a wonderful Weekend!